It may not be December 25 yet, but it’s not too early for a Christmas miracle. 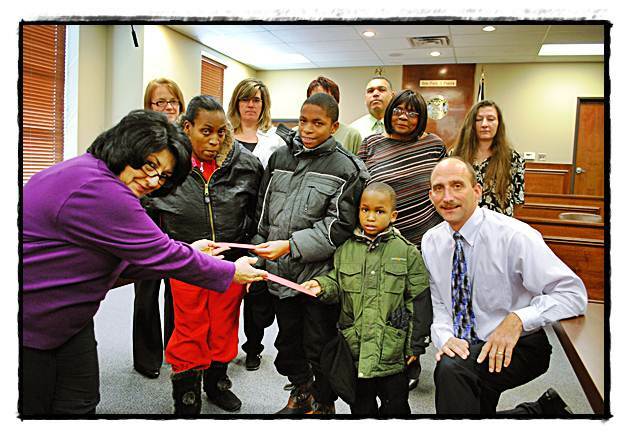 That was the case at the 31st District Court yesterday (Dec. 16) when the employees presented the proceeds from their casual Friday fundraising drive to two needy Hamtramck families. After a year of collecting at least one dollar from each worker, there was enough money to purchase a $150 gift card from the shopping store Meijer for each family. It was the second year that the court employees went casual for a cause. Judge Paul Paruk initiated the practice last year after hearing about a similar idea at a ceremony for Oakland County Executive L. Brooks Patterson. Enough money was raised this year to also provide a gift basket for a senior citizen who lives alone with his dog on Holbrook St.
At the ceremony, Judge Paruk chatted with this year’s recipients, who were referred by Holbrook Elementary School and Our Lady Queen of Apostles Church. As he spoke with them, he learned about their situations and circumstances. Also learning about the situations facing the recipients were the other recipients, and that was when the true meaning of Christmas shined through. After hearing about the struggles facing Carmen Hughes and her family, Laura and Glen Porterfield generously announced that they would like to donate their gift card to the Hughes family. Laura Porterfield explained that even though her family faces hardships, she is fortunate enough to still be employed in this economy. She said that in light of the Hughes’ situation she would feel best if her family’s gift card could be given them. There weren’t any objections, but it’s safe to say that if there were, they would have been overruled.